Wake up, America, We have a sleep problem. 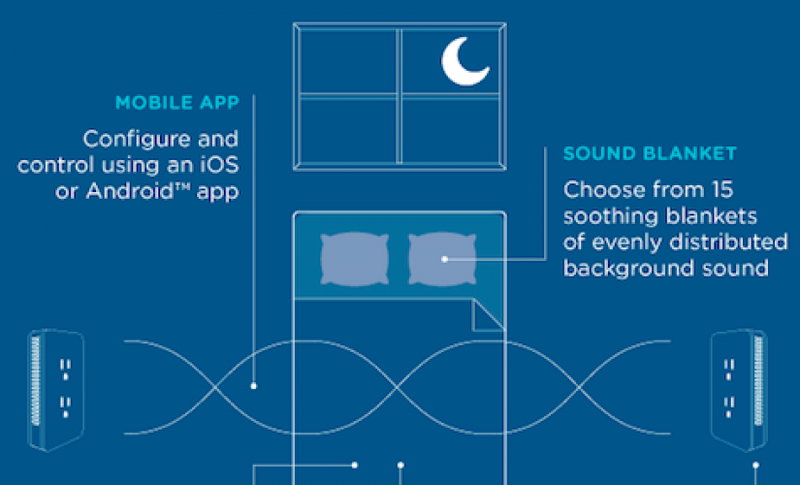 More than 68% of Americans report having trouble sleeping at least once a week, and many people believe that technology plays a major role in keeping them awake, but can it actually help you get a better night’s sleep? After all, the Internet of Things already helps make our day-to-day lives easier and more efficient: from keeping an eye on your house to regulating your pet feedings to keeping track of how many steps you take each day. But, we can’t ignore sleep as we turn to IoT for help with our daily (and nightly) tasks. As Arianna Huffington told Stanford MBA students, sleep is a “productivity tool,” which is why it only makes sense to develop a platform to help us sleep better. Sleep deprivation is also a health issue, and according to the Harvard Business Review, it’s not just an individual health hazard – it’s a public one. The IoT is just starting to break its way into the healthcare space, with doctors, hospitals, and diagnosticians taking advantage of new technology to help their patients. But there is still a huge opportunity for the Internet of Things to improve consumers’ health by simply helping them get a better night’s sleep. For more than 15 years, Cambridge Sound Management has made it our business to make people more productive. As the world leader in sound masking technology, our commercial sound masking products emit low-level, unobtrusive background sound, similar to airflow, designed to reduce distractions and the intelligibility of speech. Over the years, our clients have seen the difference our sound masking technology has on their work environment and have often asked us for solutions to noise distractions in their own home. Many own a white noise machine or sleep with a fan on year-round to drown out unwanted noise, but the single point of sound in these devices makes it easy for our brains to focus on where the noise is being emitted, which doesn’t actually make for a more restful night’s sleep. At Cambridge Sound Management, we know this is the number one shortcoming of traditional white noise machines and fans because it’s an issue we conquered years ago when we invented direct-field sound masking for our commercial business. Instead of one big speaker in an office to mask sound, we spaced out our smaller emitters in a grid layout to create a more uniform distribution and more effectively reduce noise distractions. But sound masking doesn’t just replace one unwanted sound with another (like your fan or ocean sounds playlist); it masks that unwanted sound through a sound at the right frequency and decibel level on the sound curve that is comfortable and barely noticeable to the human ear. To draw a comparison, you can drown out the light from a flashlight with a high power flood light, or you could perfectly dim the lights to eliminate the impact of the flashlight. This is how our sound masking systems work. But, as Ms. Huffington pointed out, productivity isn’t limited to the boardroom: it first starts with productive sleep at home. Hearing the need for a more advanced solution to noise distractions in the home, we took our expertise in sound masking and developed a solution that masks unwanted noise where people need it most: the bedroom. That’s why we created Nightingale, the world’s first smart sleep system designed for today’s connected home. Nightingale’s unique, two-unit system creates uniform and even soft, ambient sound (called sound blankets) that ensure the brain cannot localize on the source of the sound, making for a truly quieter night’s sleep. Nightingale sound blankets were designed by our sound scientists to immerse the entire bedroom in our proprietary sound curve, which is optimized to mask the most common indoor and outdoor noises that interrupt sleep. Two speakers on either side of the room and low to the ground project our sound blankets in a dogbone or bipolar pattern, so when Nightingale is behind furniture, the sound or overall effect isn’t impeded. 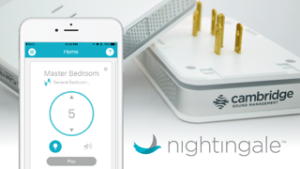 Through the iOS and Android app, you can optimize Nightingale to fit your room’s specific acoustics and sleeping conditions: for instance, adjust for a hardwood or carpet floor, the type of room you’re in (whether an adult bedroom, child bedroom or hospital room) and account for health conditions like snoring or tinnitus. Nightingale seamlessly integrates with other smart home devices such as Nest, Ring, and Philips Hue via the popular IFTTT platform and can be controlled by voice with Amazon Echo. Nightingale offers 15 different ambient sound blanket options and, if you prefer, different nature sounds, all designed to ease you to sleep. We understand that no two rooms or people are the same, so Nightingale flexibly accommodates your sleeping conditions and preferences. We’re excited to be among the first to leverage IoT technology to truly change your quality of our sleep. Learn more about Nightingale here. This article was produced in partnership with Cambridge Sound Management.